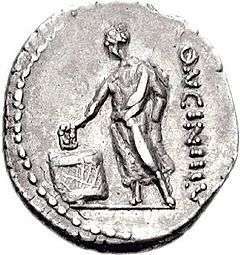 Elections were used as early in history as ancient Greece and ancient Rome, and throughout the Medieval period to select rulers such as the Holy Roman Emperor and the Pope. In Vedic period of India, the raja (chiefs) of a gana (a tribal organization) was apparently elected by the gana. The raja belonged to the noble Kshatriya varna (warrior class), and was typically a son of the previous raja. However, the gana members had the final say in his elections. The Pala king Gopala (ruled c. 750s–770s CE) in early medieval Bengal was elected by a group of feudal chieftains. Such elections were quite common in contemporary societies of the region. In Chola Empire, around 920 CE, in Uthiramerur (in present-day Tamil Nadu), palm leaves were used for selecting the village committee members. The leaves, with candidate names written on them, were put inside a mud pot. To select the committee members, a young boy was asked to take out as many leaves as the number of positions available. This was known as the Kudavolai system. Ancient Arabs also used election to choose their caliph, Uthman and Ali, in the early medieval Rashidun Caliphate. Questions of suffrage, especially suffrage for minority groups, have dominated the history of elections. Males, the dominate cultural group in North America and Europe, often dominated the electorate and continue to do so in many countries. Early elections in countries such as the United Kingdom and the United States were dominated by landed or ruling class males. However, by 1920 all Western European and North American democracies had universal adult male suffrage (except Switzerland) and many countries began to consider women's suffrage. Despite legally mandated universal suffrage for adult males, political barriers were sometimes erected to prevent fair access to elections (See Civil Rights movement). The question of who may vote is a central issue in elections. The electorate does not generally include the entire population; for example, many countries prohibit those judged mentally incompetent from voting, and all jurisdictions require a minimum age for voting. In Australia Aboriginal people were not given the right to vote until 1962 (see 1967 referendum entry) and in 2010 the federal government removed the rights of prisoners to vote (a large proportion of which are Aboriginal Australians). Suffrage is typically only for citizens of the country, though further limits may be imposed. However, in the European Union, one can vote in municipal elections if one lives in the municipality and is an EU citizen; the nationality of the country of residence is not required. In some countries, voting is required by law; if an eligible voter does not cast a vote, he or she may be subject to punitive measures such as a fine. As far as partisan systems, in some countries, only members of a particular political party can be nominated. Or, any eligible person can be nominated through a petition; thus allowing him or her to be listed. Electoral systems are the detailed constitutional arrangements and voting systems that convert the vote into a political decision. The first step is to tally the votes, for which various vote counting systems and ballot types are used. Voting systems then determine the result on the basis of the tally. Most systems can be categorized as either proportional or majoritarian. Among the former are party-list proportional representation and additional member system. Among the latter are First Past the Post (FPP) (relative majority) and absolute majority. Many countries have growing electoral reform movements, which advocate systems such as approval voting, single transferable vote, instant runoff voting or a Condorcet method; these methods are also gaining popularity for lesser elections in some countries where more important elections still use more traditional counting methods. The nature of democracy is that elected officials are accountable to the people, and they must return to the voters at prescribed intervals to seek their mandate to continue in office. For that reason most democratic constitutions provide that elections are held at fixed regular intervals. In the United States, elections are held between every three and six years in most states, with exceptions such as the U.S. House of Representatives, which stands for election every two years. There is a variety of schedules, for example presidents: the President of Ireland is elected every seven years, the President of Russia and the President of Finland every six years, the President of France every five years, President of the United States every four years. 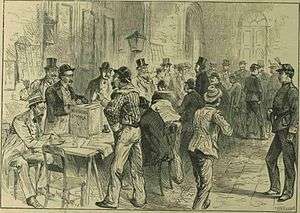 The Presidential Election in Argentina, the Polling-Station at the Church of La Merced, Buenos Ayres. "The rival voters were kept back by an armed force of police out of sight of each other, only batches of two ar three being allowed to enter the polling-office ata time. 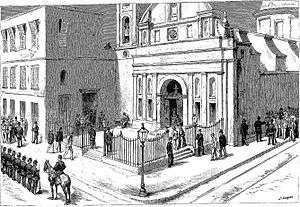 Armed sentries guarded the gates and the door leading to the office, and were also posted on the roofs of the adjoining houses and in the belfry and tower of the church." (G. Durand, The Graphic, 21 May 1892). This can include confusing or misleading voters about how to vote, violation of the secret ballot, ballot stuffing, tampering with voting machines, destruction of legitimately cast ballots, voter suppression, voter registration fraud, failure to validate voter residency, fraudulent tabulation of results, and use of physical force or verbal intimation at polling places. Other examples include persuading candidates into not standing against them, such as through blackmailing, bribery, intimidation or physical violence. ↑ Robert, Henry M.; et al. (2011). Robert's Rules of Order Newly Revised (11th ed.). Philadelphia, PA: Da Capo Press. pp. 438–446. ISBN 978-0-306-82020-5. ↑ Eric W. Robinson (1997). The First Democracies: Early Popular Government Outside Athens. Franz Steiner Verlag. pp. 22–23. ISBN 978-3-515-06951-9. ↑ Nitish K. Sengupta (1 January 2011). "The Imperial Palas". Land of Two Rivers: A History of Bengal from the Mahabharata to Mujib. Penguin Books India. pp. 39–49. ISBN 978-0-14-341678-4. ↑ Biplab Dasgupta (1 January 2005). European Trade and Colonial Conquest. Anthem Press. pp. 341–. ISBN 978-1-84331-029-7. ↑ VK Agnihotri, ed. (2010). Indian History (26th ed.). Allied. pp. B–62–B–65. ISBN 978-81-8424-568-4. ↑ "Pre-Independence Method of Election". Tamil Nadu State Election Commission, India. Retrieved 3 November 2011. ↑ "India's spend on elections could challenge US record: report". NDTV.com. Retrieved 2016-02-25. ↑ "Free and Fair Elections". Public Sphere Project. 2008. Retrieved 8 November 2015.